About this time two years ago we were all getting excited about the tightest Calderdale League 1 title race ever. Hebden Bridge ‘A’ fell across the finishing line with a draw giving Todmorden ‘A’ the opportunity to steal the title if they could win 5-0 at Huddersfield ‘B’. They won 4-1 and lost out by a single board point. This year’s title race has been even more compelling and, although Hebden Bridge aren’t directly involved they played their part on Wednesday night in setting up a three-way photo finish that reminds us of this iconic image from the recent Winter Olympics in Sochi. 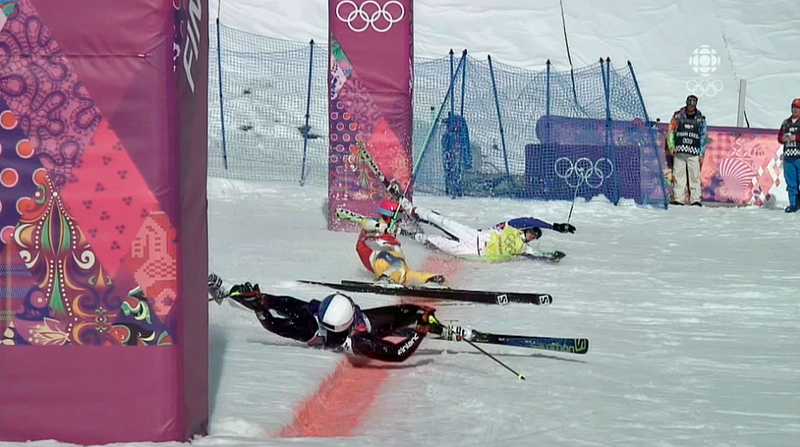 You might have enjoyed watching this entertaining end to one of the ski-cross races as three competitors fell and slid across the finishing line almost in unison. This season’s League 1 title race has been similarly unpredictable with seemingly no-one able to assert their authority for long. Which of the final three contenders will step up to take the crown from Hebden Bridge on Monday night? Hebden Bridge ‘A’s title ambitions for this year were finally expunged by Halifax in the last round of matches but, if they are honest with themselves, they’ll have realised some time ago that the game was up. Since they beat Halifax away last November they have won only one match and drawn two from their last eight fixtures. That’s relegation form. That said, Nick Sykes’ team have fought hard in every encounter and tried to defend their title with as much vigor and determination as ever. Before this week’s round of fixtures Huddersfield seemed to have the title race under control as they were two points clear of Halifax ‘A’ and Courier ‘A’ and three clear of Todmorden ‘A’. On Monday night those two teams did their job to make the run in as close as possible by winning in very different circumstances. Halifax were due to host Todmorden ‘A’ who still had an outside chance of catching up themselves if they could win this match and then beat Huddersfield at home in the final round. However, Todmorden’s old ‘away fixture’ weakness returned to haunt them as they found that several regular A-teamers were unavailable and were forced to decide between fielding a weakened line up at Halifax or playing a strong ‘B’ team at home against Brighouse to try and secure that team’s league 1 status. Bizarrely (from this observer’s perspective at least!) they chose the latter and whilst Todmorden ‘B’ won narrowly 3-2 to condemn Brighouse and Hebden Bridge ‘B’ to the drop, the ‘A’ team defaulted their match against Halifax completely. This 5-0 walkover may yet have a significant impact on the destiny of the title. Meanwhile Courier ‘A’ were also struggling to field a side as they arrived at the Trades Club to play Hebden Bridge ‘B’ with only four players. It could have been disastrous for their title bid but the quartet they did bring were still too strong for Hebden who only managed to add a draw to the point gained from the defaulted board. Martin Syrett did continue his recent excellent form by drawing with Dave Patrick but that was as good as it got for Hebden Bridge ‘B’ who have endured a torrid time this season. They finish off with a wooden spoon contest against Brighouse on Monday with both teams doomed to the lower division already. Now all eyes could turn towards the Lindley Liberal Club for Wednesday’s clash between Huddersfield and Hebden Bridge ‘A’. Halifax and Courier players had everything crossed in the hopes of any kind of away result. Even a draw would have given them hope of catching up with the leaders. Hebden Bridge ‘A’ have a truly execrable record against Huddersfield. Just one win in the last five years and that was last season at Huddersfield when the home side only fielded four players! To make matters worse Matthew Parsons and Nick Sykes couldn’t play and Matthew Webb was unavailable too. This forced Dave Shapland, the stand in Captain on the night, into drastic measures as he called on the services of regular super-sub Andy Bak and virgin debutante Calderdale Leaguer Ihor Lewyk. The philosophy for Hebden Bridge was straight forward: “If you want to take our crown from us then you’ll have to break our fingers to get it!” Hebden have fielded very strong line-ups against their closest rivals this season and they weren’t about to abandon that approach just because they were out of contention for the title. Huddersfield meanwhile had also fielded a strong team though perhaps, with half an eye on Monday’s visit to Todmorden, not their very strongest. Another epic contest was in the offing as the ten players sat down to start the clocks. The first game to finish was the top board encounter between Ihor and Greg Eagleton. The opening was a Czech Benoni which is typifed by a closed pawn structure in the centre and some deep manoeuvring in the trenches and on the flanks. Neither player was in the mood to take too many risks and as the heavy pieces started to come off they agreed to peace. Shortly afterwards another draw was agreed on board 5 where Hebden’s Andy Leatherbarrow initially appeared to have gained the upper hand right out of the opening. Unwittingly Tony Aguirre had wandered into a line of the Nimzowitsch Defence that Andy had looked at that very day and he deployed a tactical trick to win a pawn and seemingly put the White king in grave danger. However, Tony kept his head and calculated that by moving his king to f2 would solve his immediate problems and simplify the position a good deal. His idea worked to the extent that he gained a bishop pair against Andy’s brace of knights as compensation for Black’s extra pawn and the two entered the endgame early. Once again neither player wanted to risk too much in a very balanced position and they quickly agreed to a draw. The last three games went on far longer and on they seemed to be very close indeed. On board 2 Andy Bak had gained a very pleasant position against Mitchell’s Spanish by deploying the Smyslov Variation (typified by 3…g6). On board 3 Pete Leonard was up against Huddersfield’s own latest recruit, Imre Zelei, who had boldly deployed the Four Pawns Attack against Pete’s Alekhine’s Defence. However, Pete used some opening preparation of his own as he unleashed the unusual and very interesting move 5…g5!? which is at the extreme end of the ‘hypermodern’ spectrum. Imre sensibly kept the tension in the position and carefully maintained his pawn centre until on move 22 his, and subsequently, his team’s, night came to a rather abrupt end. There was a sudden rush of action on the remaining three boards. Poor Imre had simply removed the protect from an attacked knight and therefore lost it on the spot. He had no compensation whatsoever and therefore had to resign. This was shortly followed by an equally sudden and unexpected catastrophe from Mitchell on board 2. Realising that he possibly had to play for a win to maintain his sides chances he opted to hide his king on h1 on move 29 but this allowed Andy to play a nice combination which won a piece and incredibly the match was over. This just left Dave Shapland to add the cherry to the cake as he lured Dave Tooley into a pawn grab with his queen on b7. The subsequent open b-file was acquired by Black’s rook which then landed on the seventh rank. Tooley tried to surround the rook but in doing so he allowed his opponent to sweep his defending pieces from the king-side, push forward with his f-pawn and then offer a rook sacrifice on f2. Subsequent analysis prooves that, for once, Dave Shapland’s idea was sound and he went on to force the enemy king into the open. From there it was reasonably simple. Another dramatic chapter in the long history between these two rivals was written then and on this occasion the outcome was a devastating blow for the home team although they were as generous and sporting in defeat as they are gracious in victory. They now have to go to Todmorden ‘A’ on Monday and win to have any chance of taking the title. They must also hope that Courier and Halifax draw their match or that Courier win by a point less than they do at Todmorden. You can view all the games from the Huddersfield vs. Hebden Bridge ‘A’ match in the viewer below. My thanks to all the Hebden team who have taken the time to add some commentary to their games. All that remains for me to say is “Good luck!” to all three teams involved in Monday night’s showdown. Whoever does inherit Hebden Bridge’s crown will be very, very worthy ‘Kings of the Valley’ this year. Lots of stuff to look through that is of interest to myself, Czech Benoni first lots of points to consider given the move order, Black could consider 4…Be7 to try and the bishop exchange in if white doesnt play Nf3, and can still head off for the main line if he does, personally I would play nbd7 delaying o-o to allow nf8 then ng6 responce to h3 g4 lines, whites misses out on the most active lines at move 9, alternatives include q side action with 9 a3 or 9 Rb1 or 9.Ne1, also Black has option at move 8……a6 before intiating Kside action with g6. Line followed is Gerard-Stark Nancy 2007 up to move 13 where the choice was to retreat the bishop instead of exchanging it. Maybe leaving the N on g4 and Bd7 with g5 Qe8 and then Qh5 attacking ideas. Next up Petes game, enjoyed playing through it, also went and lokked up the variation in a little more detail, some of the possible lines are really wild but seems to hold together, brilliant surprise weapon Pete. Well played Dave, some really nice lines in your analysis again very enjoyable to play through.